The loneliness of the long-distance cyclist | Explore The Adventure. . . . .
one man's magical adventure round the world . . . Explore The Adventure. . . . . Regular readers of this column will know that I like to hop on a train in Peterborough and then get off at any of the exciting destinations that Virgin East Coast will take me to. 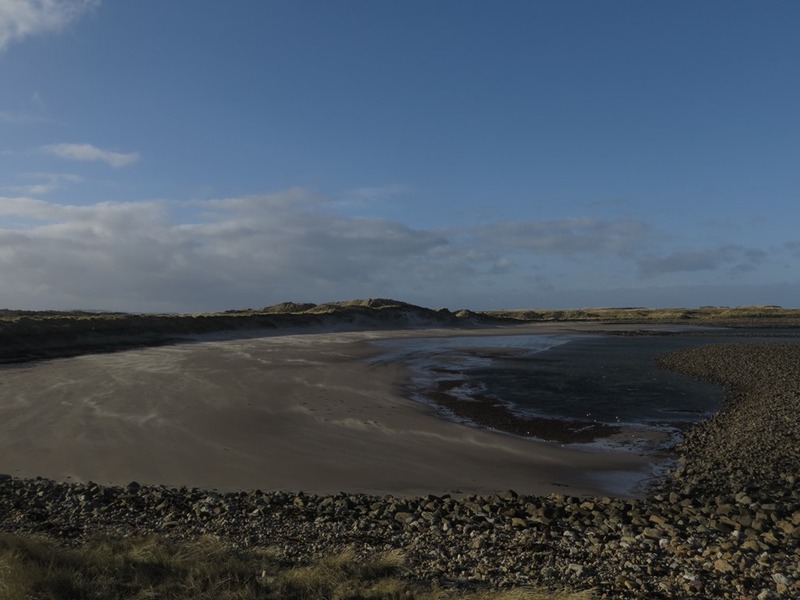 The fact that I can sometimes managed to get a trip up to the Northumberland coast for £20 just adds to the excitement. 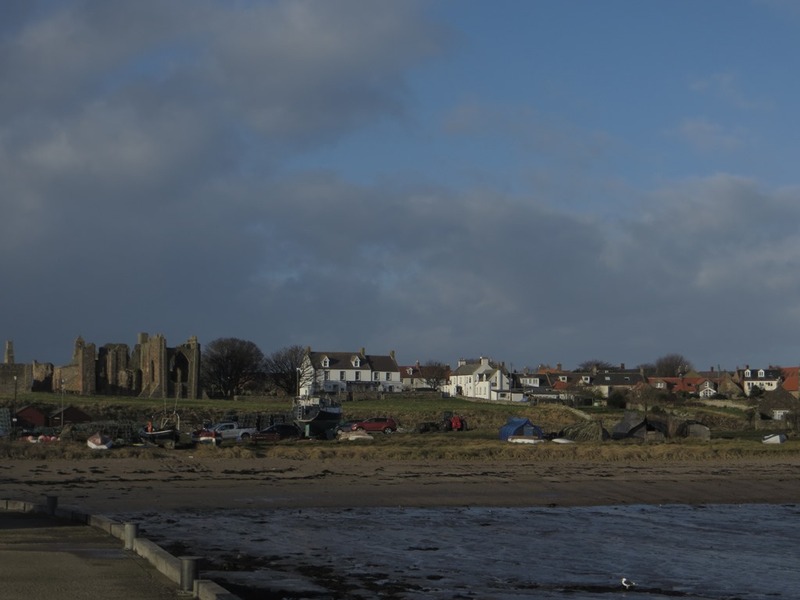 Some of you will also know that one of my very favourite places to go is to the Holy Island of Lindisfarne… under 3 hours to Berwick-Upon-Tweed and then a bus ride to the Holy Island. Apart from the fact that if you go between September and May, the buses only run on Saturdays and Wednesdays. If the tides are right. Maybe. 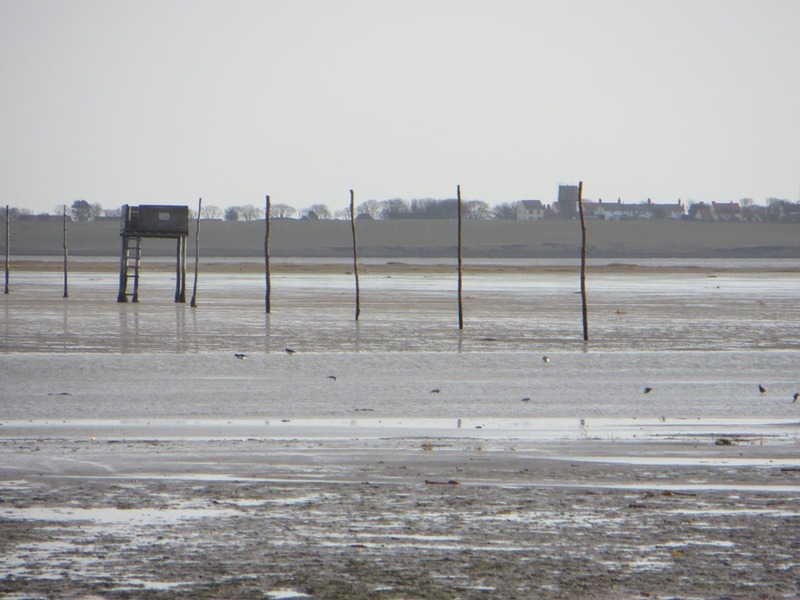 Holy Island is cut off from the mainland by a tidal causeway. 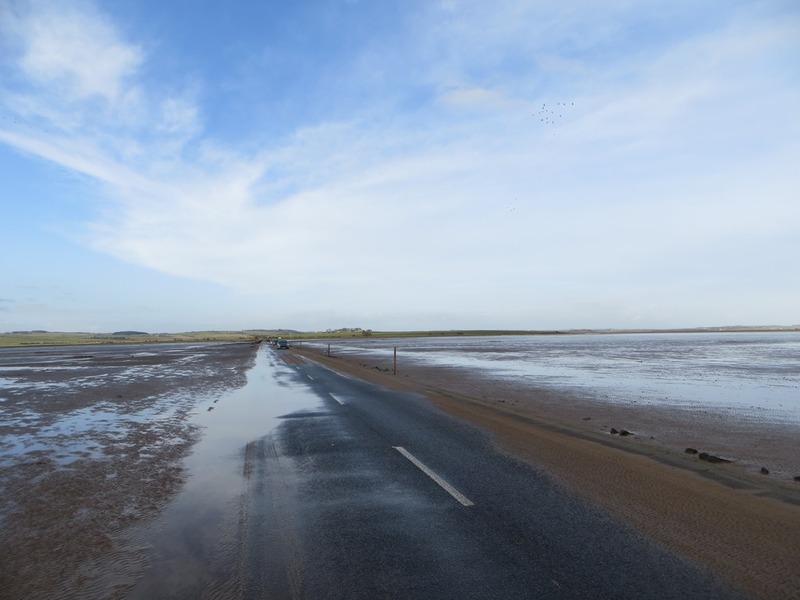 It opens for around 6 hours a day – attempting to cross the causeway at any other time will result in your vehicle being swept nonchalantly out to sea. So.. last time I visited, I got the bus down and then walked the five miles back from Holy Island to the A1 and then caught a more frequent bus back to Berwick. THIS time, I wondered what would happen if I cycled it. Now I know. A leisurely start to the day, then, although the frantic rush and pressure from the station staff to get the bike on the train is guaranteed to frazzle all but the most Zen-like of souls. 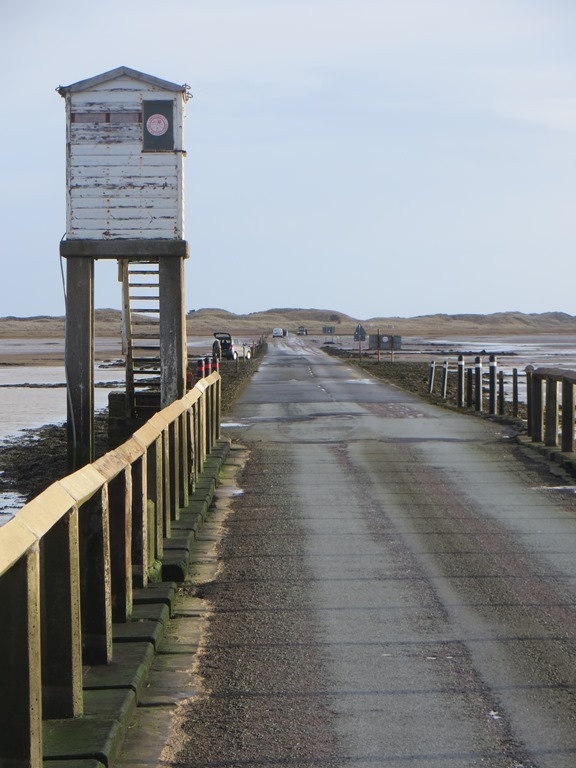 And then, off at the other end, and, carrying a full pack, I and my bike are off on the 26km journey to the Holy Island. Now, you need to be aware of a couple of things. Firstly, I am carrying a reasonably heavy pack. This, when added to the weight of a reasonably heavy human, is making for difficult going. Secondly, I have four hours to do this trip in. Any longer, and I won’t make the crossing. Which means I won’t have anywhere to sleep. And it’s January. This should be easy, but the possibility of issues with the bike are ever-present. As I set off, I become aware of two other factors. The first is that cycleway route one is not exactly what I would call paved cycling surface. Now, I knew this. But now I am experiencing the difference between knowing, and REALLY knowing. And I have slick racing tyres on the bike. I also realise that although I have checked the weather forecast for rain (none), I have not checked it for winds. The current 50 mile an hour winds blowing make travelling east a delight, but really do take it out of you when travelling west. But the day is lovely, the sea is gorgeous, and provided I don’t get blown off the cliff edge, I should be fine. This is what I love about this part of the world – the wild, rough, pure nature – the elements truly unleashed to create an intoxicating and refreshing day out. It’s hard work, but eventually the causeway comes into view. Unfortunately, route one now wants to take me inland. This is the toughest part of the ride across fields in the wrong direction – but knowing that all will come good in the end. The road. The causeway. 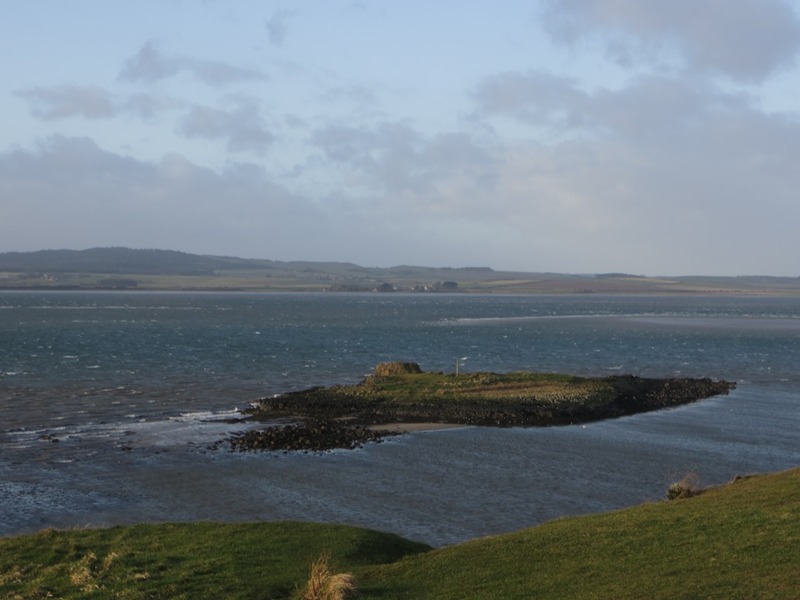 And finally, I am over the bay and onto Lindisfarne. Tonight, I will have a bed to sleep in. 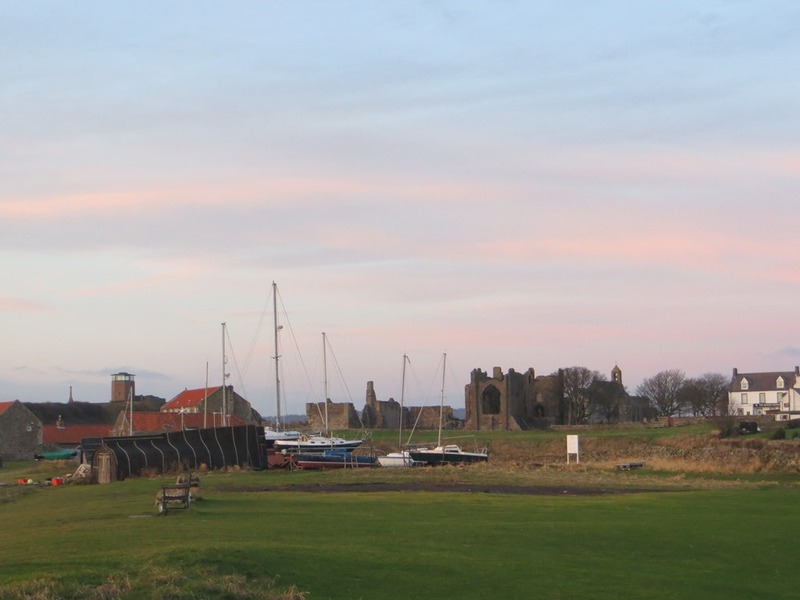 Lindisfarne is beautiful. Truly beautiful. And this time of year, it is especially gorgeous.. and quiet. 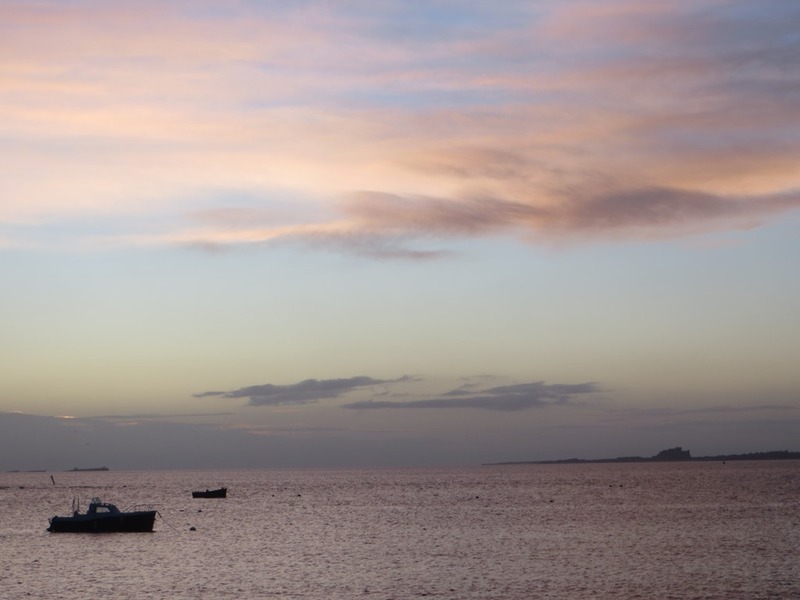 Once the day visitors are gone, and the tide comes in and the causeway shuts, a wonderful peace descends upon the island, punctuated only by the clinking of ships’ rigging – and the incessant winds. I collapse into bed – deeply deeply happy, deeply deeply peaceful, and totally and absolutely exhausted. The winds have not died away overnight, and the island is swept by never ending gusts of wind. 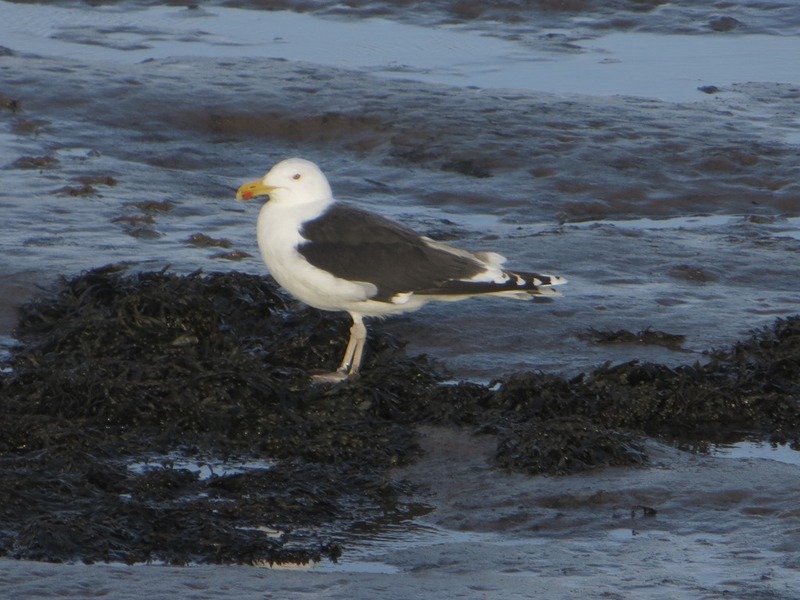 The gulls seem to be in their element – playing in the wind, held aloft by the roaring energy that they face into. Every now and again they turn and race downwind, as if just for the sheer joy of it all. 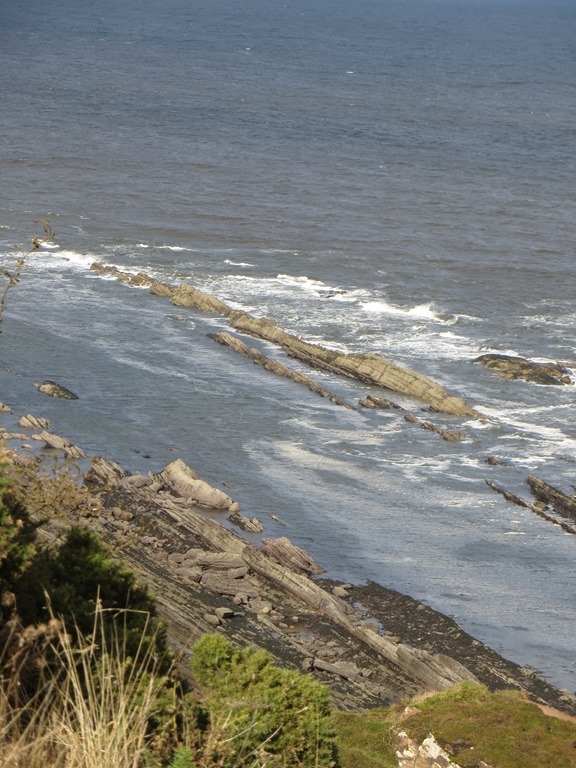 One of my favourite spots is The Heugh, a ridge of rock that runs down the west of the island. 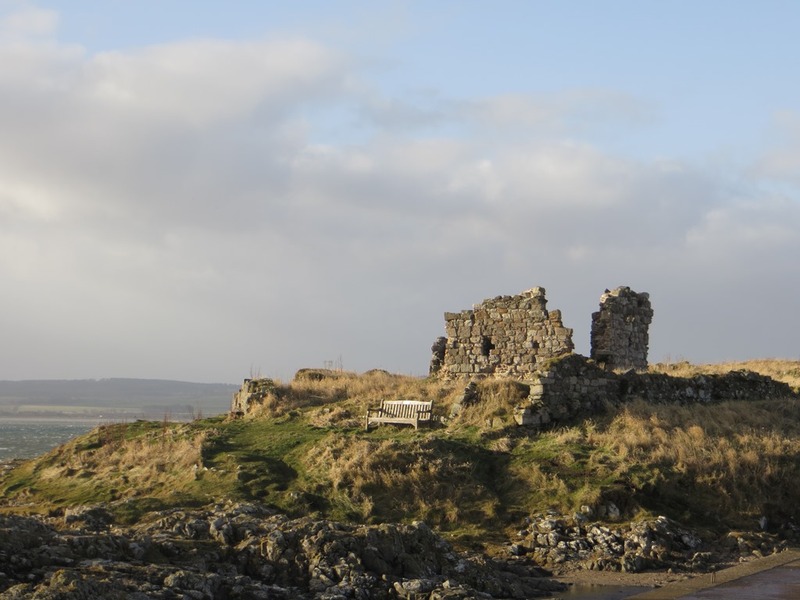 From there you can see back to the mainland, the twin spires of Heugh Hill and Guile Point obelisk lighthouses, and the ruins on St Cuthbert’s Island, another tidal island cut off at mid tide, where St Cuthbert spent time before leaving for the total isolation of the Farne Islands. 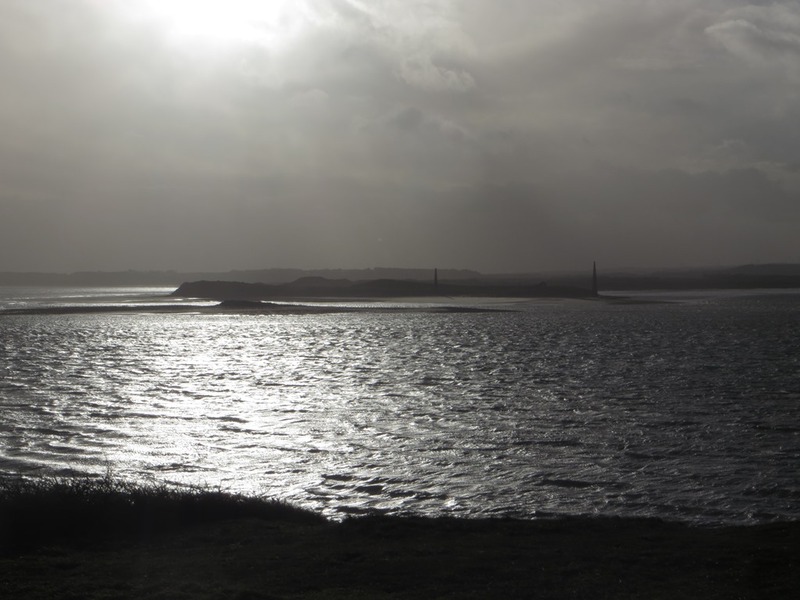 I wander down to the harbour – the boats are riding out the waves, and I am taken by surprise by a seal in the dunes. The seal is equally surprised to see me, but flops back to sleep – exhausted, I suspect, by the storm. When I check back later, he is gone. The shore is peppered with upturned boats, turned into storm-proof sheds with tarpaulins. It is also liberally strewn with crab pots and the detritus of a working harbour. 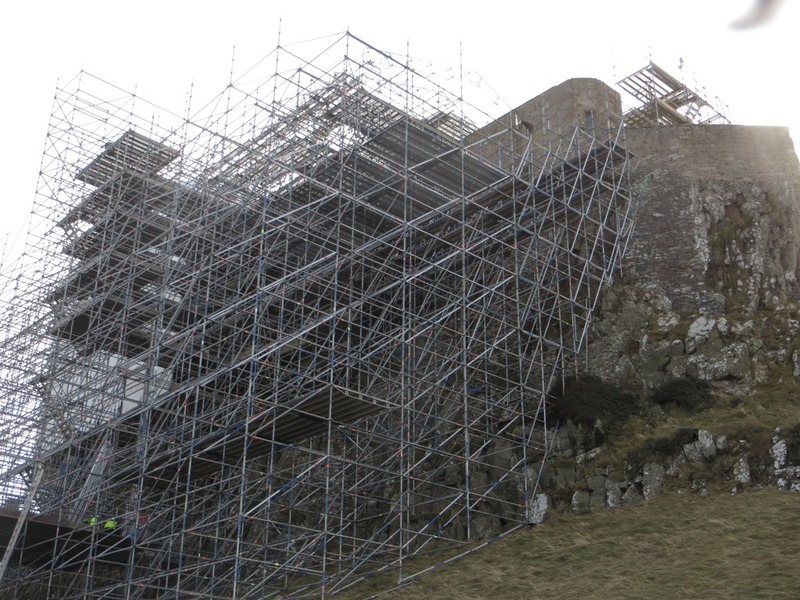 The castle is still closed for maintenance – surrounded by a giant marquee and a skeletal scaffolding, it should reopen this spring. And off I go, braving the wind for a three hour walk round the island. I see very few people, which suits my mood of thoughtful introspection. 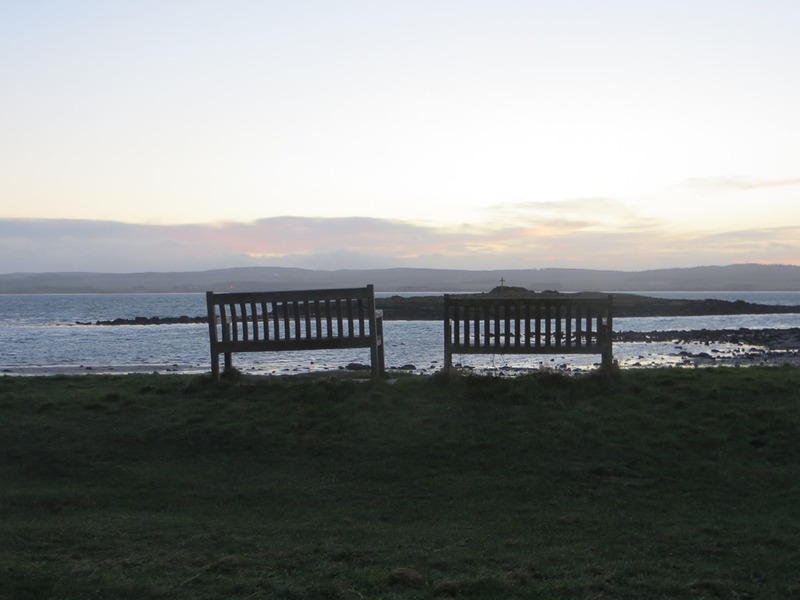 There are plenty of sheep, gulls, snipe and migratory geese to keep me company.. In places, the sands drift-race across the beach as they dry, freeing up the grains for a mad dash across the beach before they are caught by grass, pebbles, seaweed, a stray seashell. And I am very glad of my hat. And my gloves. 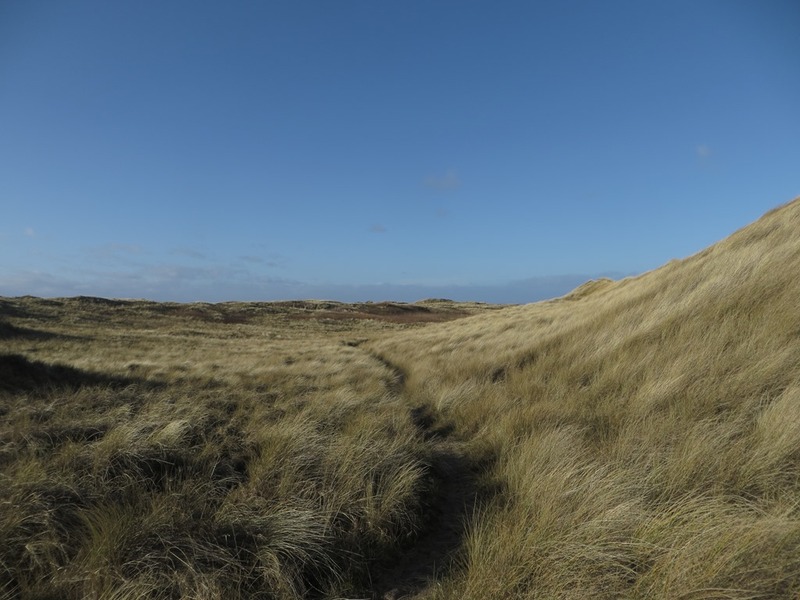 The dunes are hard work, although at least they offer shelter from the wind, the heavy covering of grass holding them in place. But finally I make it back into the village – most of the shops and tea rooms are closed for the winter, although the one or two that remain open show a steady trade. And so to the evening. Another peaceful walk round the village and out into the welcoming darkness. Time to think. Time to dream. Time to plan. This is my time of year for planning – my New Year starts on February 1st at the Celtic festival of Imbolc, and 2018 feels like a blank canvas, ready to be drawn upon, filled with colour and vivid images. Much has changed for me in recent months – new freedoms, new possibilities, new options – and 2019 brings the possibility of new beginnings, fresh starts, new adventures. And the stars! Away from much of our light pollution, the stars are vivid flecks of possibility on a velvet field – reminding me that this universe is so much greater and so much more incredible than I can ever imagine. Tonight, I dream. More vividly than I have in a long time. The depth of relaxation and peace is working its way into my subconscious, healing and restoring me at ever deeper levels. The next day, after an early morning walk and some sunrise photography, I am off back on the bike again. The wind has finally dropped, and I cross the causeway with ease, my only deadline being a 6:18 train home. I have 7 hours. I set off on a diversion because: pretty. This being a story of me on two wheels, keen observers of my path through life will notice that this trip, apart from the tension of deadlines and the perils of being blown into the North Sea, has been lacking in drama. Fortunately, normality is restored, and the drama that I have been running from arrives, slightly out of breath. I have a puncture. I manage to reinflate the tyre and cycle on, as I have green gunky puncture proof sealant in my tyres. Sadly, the reinflating does not last. Not only this but the valve core is now stuck in my cycle pump. When the pump is removed, the tyre rapidly deflates, showering me with the remaining green gunk and leaving me looking like Shrek on a bad hair day. A trip to a helpful garage and I manage to recover the valve core, only for the same thing to happen again. Finally I manage to inflate the tyre to something like rideable, and press on. I am ten miles from Berwick. I try not to put too much pressure on the front tyre as it is only about half pressurised. Unfortunately, this means that I cannot relieve the pressure on my already distressed derrière, and every imperfection in the road is..less than comfortable. But the bike is rolling. The day is glorious – a bright, sharp January day. The countryside is full of beauty – stark trees yet to gain their spring plumage, snowdrops braving the cold, and in the distance the snow-capped Northumberland hills. 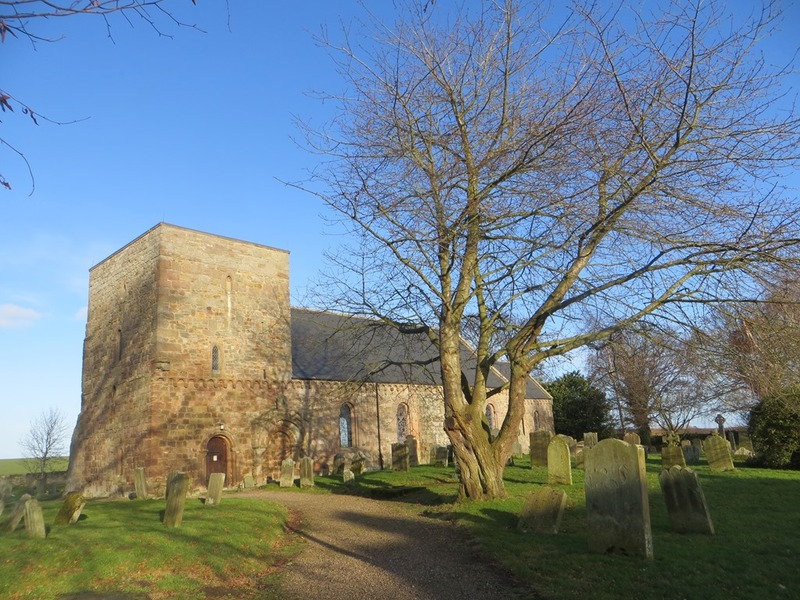 I stop off at a charming 11th century church on the way ..
And so I ride into Berwick. My legs ache, my posterior even more so – but I am happy beyond measure. 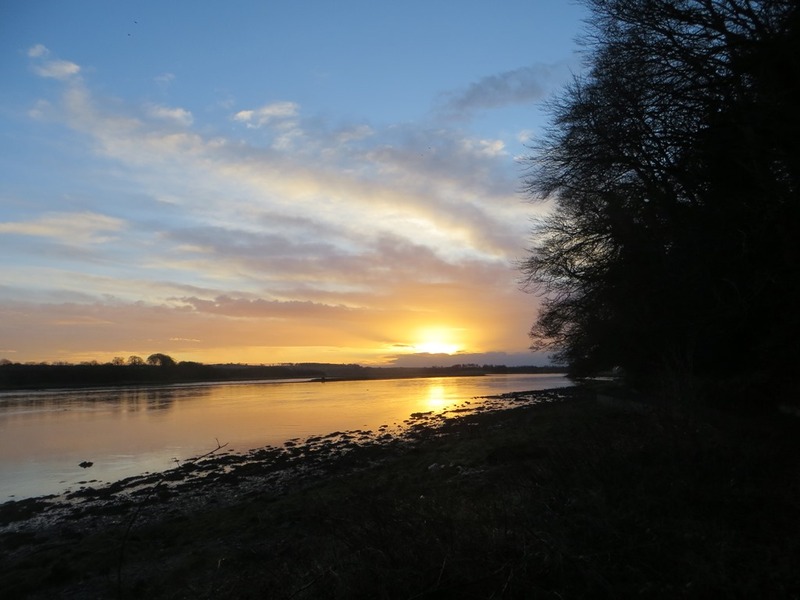 A brief ride by the Tweed to catch the sunset, a warming hot chocolate, and back on the train. I am, of course, at the wrong end of the train. The guard gives up, dumps me on the train and rides the bike to the other end. I expect the announcements to be “we are sorry for the delay to your service today..this was due to an idiot cyclist being at the wrong end of the train”. In this, at least, I am disappointed. What will I take back from my trip to this wonderful, spiritual, peaceful place? New dreams. New plans. New possibilities. An end to some dreams, and the opening up of new options. In the blink of an eye, the world is remade anew. Mistakes are erased like footprints on the beach, while possibility and hope rise again like the sunrise bringing the promise of a new dawn. I know that whatever life has thrown at me, and wherever I have been less than I could be, I know with absolute certainty that the world is remade in the moment of now. New starts, new choices, new adventures beckon as I create them seemingly out of the gusts that surround me. Today, I remember that the world is.. perfect. I'd love to keep you up to date with the adventure by email... so please just sign up below and you'll get each post as I write it! The last few days . . .